Nearly a year ago, I reviewed the Synology DiskStation DS212 and at the time I wasn’t very familiar with just how far NAS units have come these days in terms of software and features. Unlike NAS units of the past, NAS units of today are filled to the brim with features and are better considered as servers rather than what their name, Network Attached Storage, implies. Today, we’ll be reviewing both the Synology DiskStation DS213+ and the QNAP TS-269 Pro 2 bay NAS units. 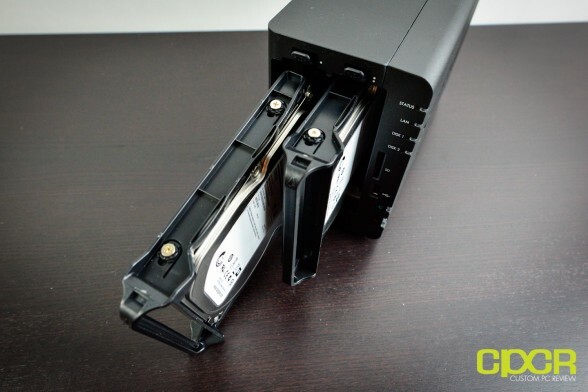 These are small business oriented NAS units, which means they’ll be right at home running web servers and database servers, but they’ll still do the typical NAS activities such as sharing files, and backing up your PC just fine. 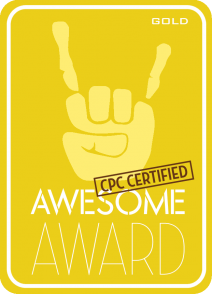 Let’s take a look at the hardware for the two units. 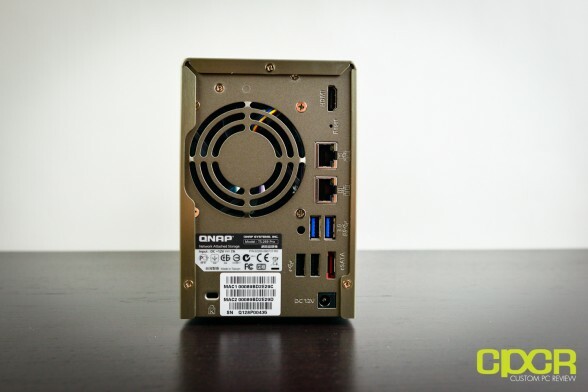 As we see here, the QNAP TS-269 Pro has significantly more powerful hardware as it’s rocking the Intel Atom D2700 processor while Synology is using a more unique FreeScale P1022 Power PC based processor for its DS213+. 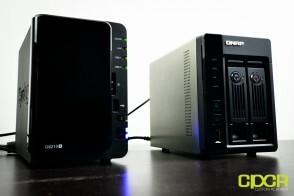 The QNAP TS-269 Pro also sports a whopping upgradeable 1GB DDR3 while the DiskStation DS213+ only sports 512MB of DDR3. Both NAS units are aimed at the business and small business audience. For additional details on the two units, be sure to visit the QNAP TS-269 Pro product page here and the Synology DiskStation DS213+ product page here. Here’s a look at the packaging for the QNAP TS-269 Pro. The box is completely littered with a ton of features included with the unit. Digging into the box here, we get a couple pieces of documentation, a software disk, a key, mounting hardware, two black CAT 5e cables, and a Delta Electronics power adapter capable of delivering up to 90w. Let’s move on to the TS-269 Pro itself. Alright, let’s take a quick look at the TS-269 Pro. There’s nothing too complicated up front here, just some LED indicators along with the power button, a one touch copy button, and a single USB 2.0 port. There’s also two hard drive bays here which we’ll move onto in a little bit. Moving around to the back of the unit, we immediately notice that QNAP has included a ton of connectivity options with the TS-269 Pro. Starting from the top, we get a HDMI port, a reset button, two Gigabit LAN ports, two USB 3.0 ports, two USB 2.0 ports, an eSATA port, a Kensington lock port, and a power port. 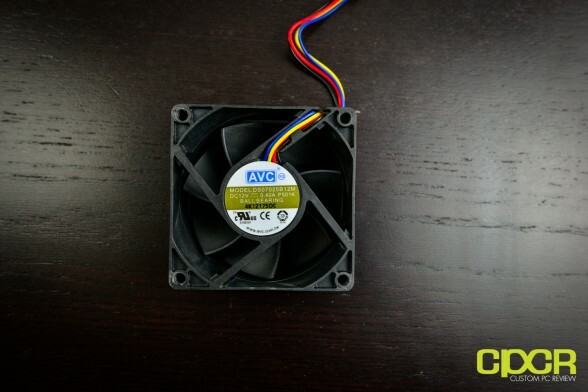 There’s also a 70mm fan as well which we’ll get into in a little bit. 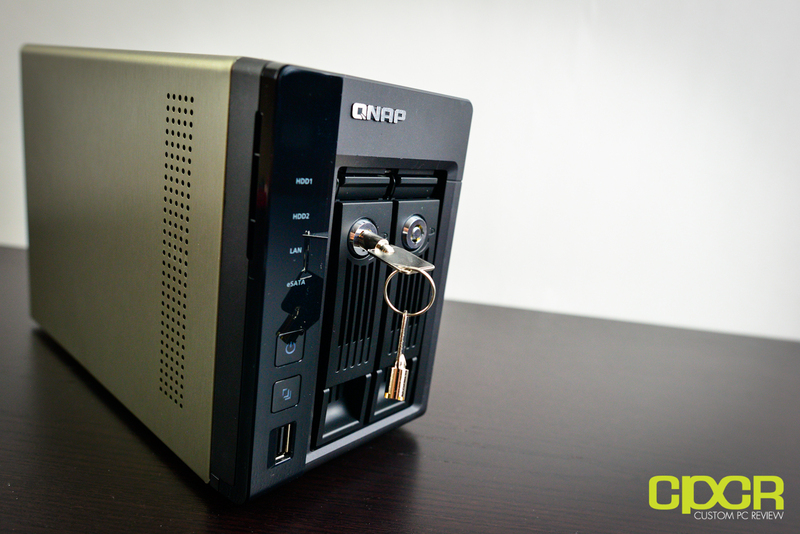 For security, QNAP has included the ability to lock each hard drive cage with an included key. Here’s a look at the hard drive cages on the QNAP TS-269 Pro. The cages are made of a metal construction and include mounting holes for both 2.5″ and 3.5″ drives. Each hard drive cage is labeled as well, so if you happen to remove both drives, it’s easy to figure out which one goes into which slot. 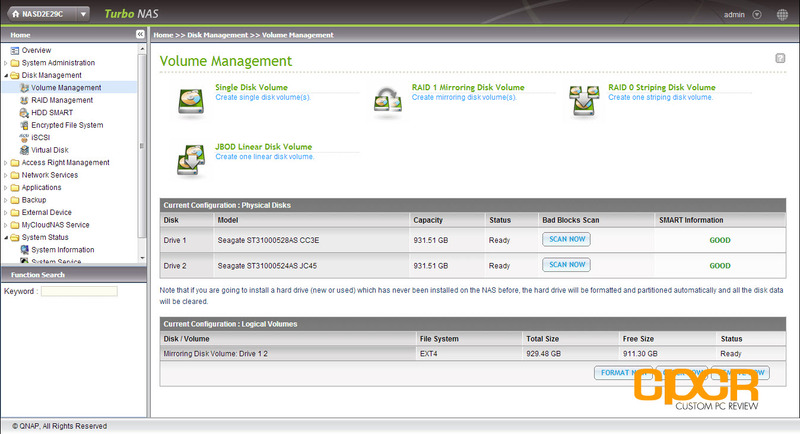 For our testing today, I installed two Seagate Barracuda 1TB 7200rpm drives as shown here. While I’m using these drives for testing, they are NOT recommended for use with NAS units. Instead, be sure to take a look at the Western Digital RED line of NAS oriented hard drives or the Seagate Constellation ES enterprise grade hard drives. 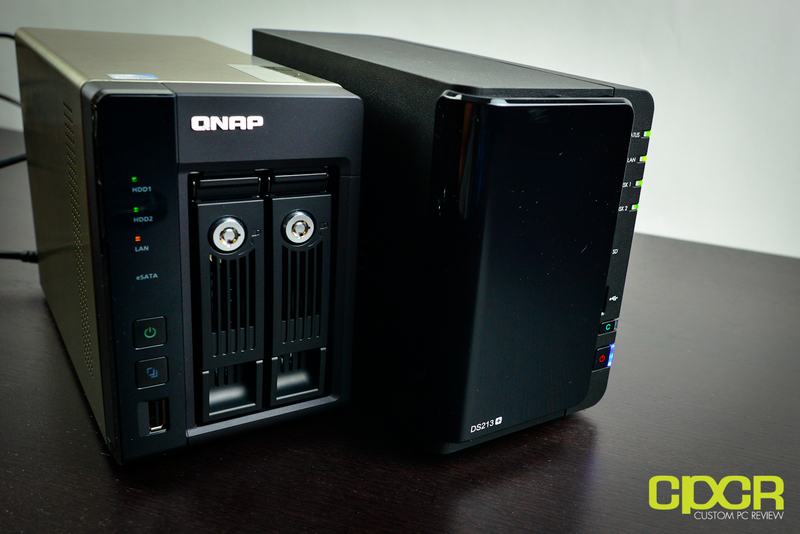 Here’s a look at the QNAP TS-269 Pro in operation. Several LEDs remind you which hard drive bays are populated and if the LAN is activated. 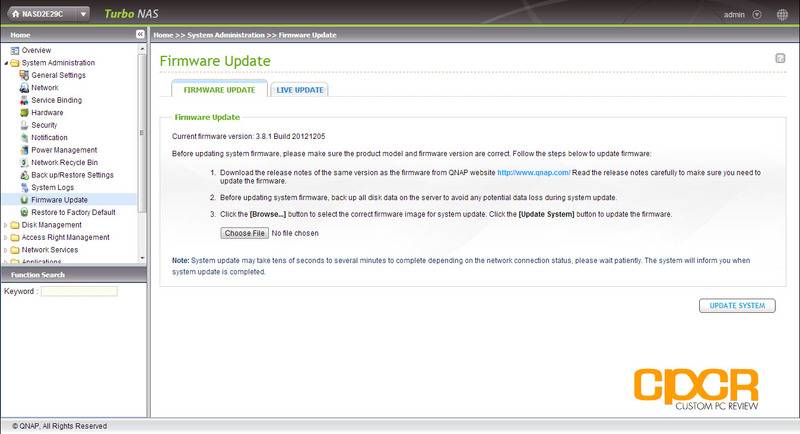 QNAP also includes alarm warnings as well to notify you of any problems with the unit. Here’s a look at the TS-269 Pro with everything taken apart. 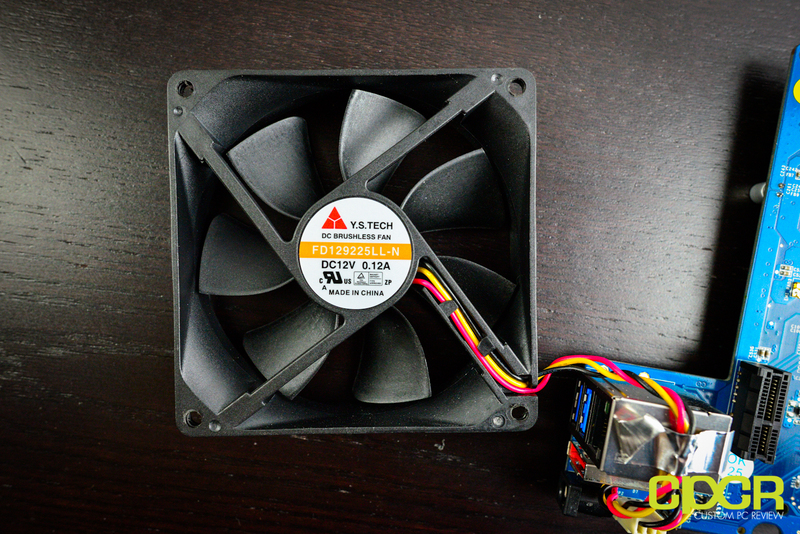 Here’s a look at the 70mm fan included with the TS-269 Pro. Replacing the fan does require you to take the unit apart, but it is possible to replace the fan in the event that fails. 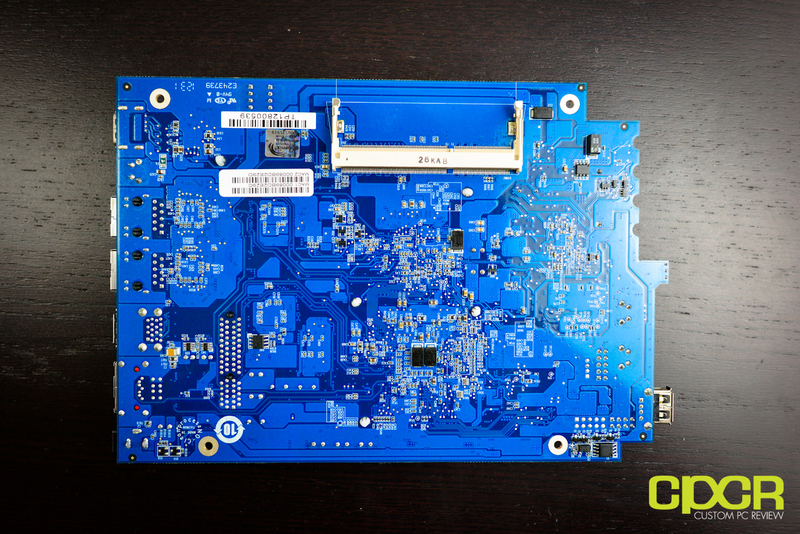 Here’s a look at the motherboard for the TS-269 Pro. QNAP has included a 2.13 GHz Intel Atom D2700 Dual Core CPU along with 1GB of DDR3 memory. The memory module used is sourced from ADATA and is glued onto the motherboard itself. Spinning around to the rear of the motherboard, we can see that there’s an additional DDR3 SO-DIMM slot back here for those interested in upgrading the memory on the unit. According to QNAP, the largest SO-DIMM that can be installed here is 2GB. For the software, I’m not really going to go into too much detail since there’s just simply way too much to cover here. 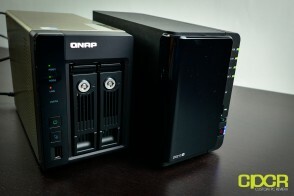 Most QNAP NAS units use the Turbo NAS Firmware, currently at version 3.8.1 (tested today). Those interested in learning more about the Turbo NAS firmware can check out a live demo of it here. 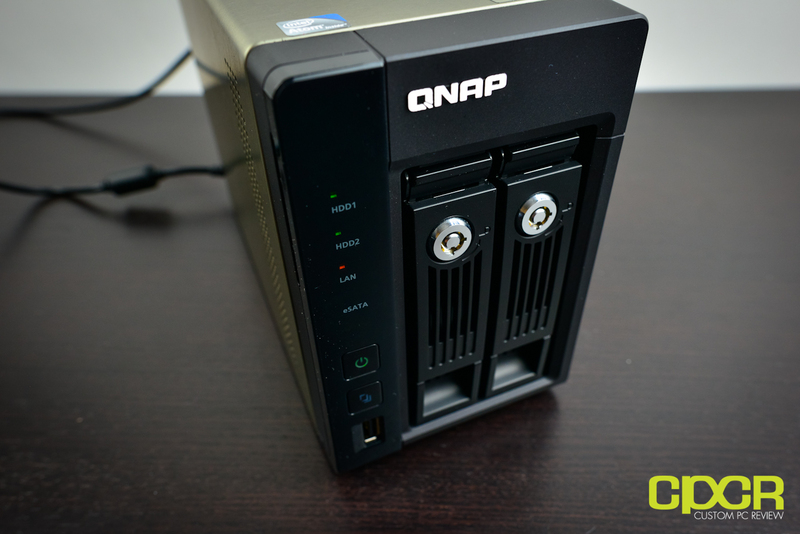 I also touch a bit on the software in my review for the QNAP TS-419 PII, so be sure to check that out here if you’re interested. Since I’m not going to go into too much detail, we’ll just be taking a look at a couple basic features on getting the unit setup. Here’s the volume management page which helps configure the drives inside. 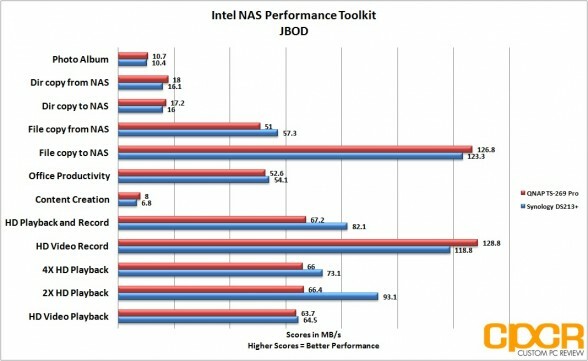 Since the TS-269 Pro is a 2 bay NAS unit, the only options here are JBOD, RAID 0, and RAID 1. 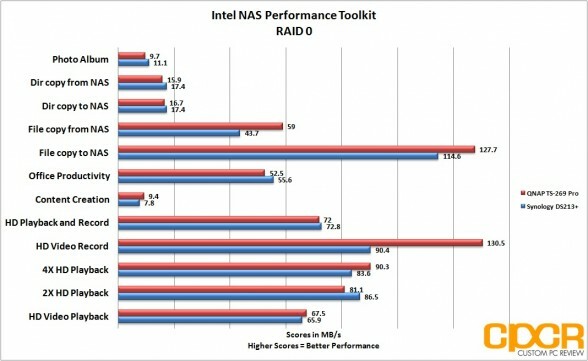 For the most part, RAID 1 will probably be the option of choice here as only RAID 1 offers any sort of redundancy. While a ton of functionality is included by default through QNAP’s firmware, there’s also a ton of software that can be added via QPKG, which is QNAP’s software package system. The operating system included with QNAP’s firmware is pretty much a custom Linux build, so a ton of 3rd party QPKG apps may be downloaded and installed as well. There’s a fairly large and fairly active community developing these packages, so there’s definitely a lot of options for additional software functionality. 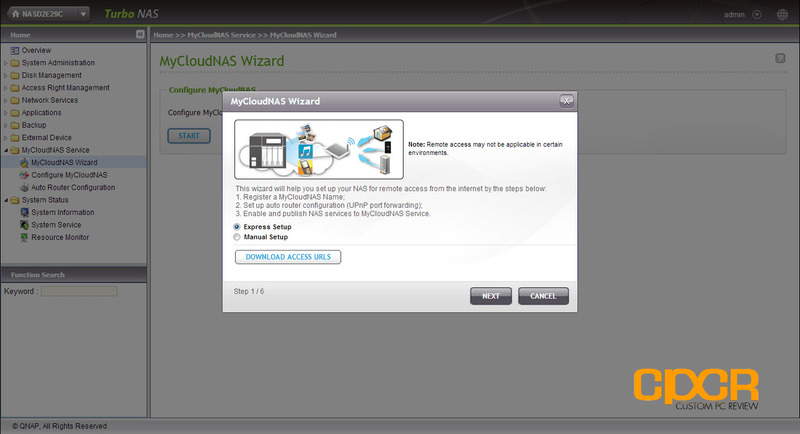 For on the go access, QNAP also includes a pretty cool feature they call MyCloudNAS. I’ve covered this before, but basically what this does is turn your NAS unit into a personal cloud. Once activated, MyCloudNAS will set up a DDNS (Dynamic DNS) service for you so that you can access your NAS anywhere so long as you have an internet connection. Finally, one feature that came out very, very recently is HD Station and XBMC support, which I think makes the TS-269 Pro a very, very versatile product and can be great for home users looking to purchase a new HTPC. Since the TS-269 Pro has a HDMI out, it can be connected to a TV or a home theater receiver, and media files can be streamed right off the unit through the XBMC software. 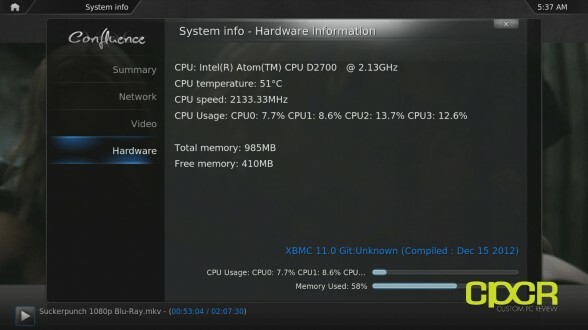 For those not familiar with XBMC, it’s a very powerful media center application that’s generally used by HTPCs. Those interested in checking out XBMC can check it out here. Above, I have a screen capture of the TS-269 Pro while playing a 1080P stream right off the internal hard drive. The playback was studder and lag free despite the high bitrate video/audio. Here we can see that memory consumption is around 58% and the CPU usage is extremely low at less than 10%. I would definitely recommend those looking to use the TS-269 Pro as a dedicated media center to upgrade the memory to 2GB or 3GB, but even with the stock hardware, I had no issues getting the unit to play high bitrate 1080p video. 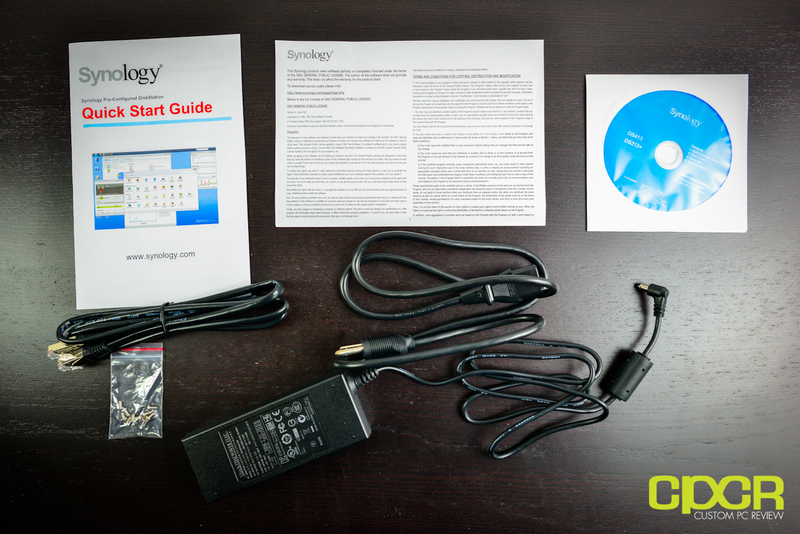 Here’s a look at the packaging for the Synology DiskStation DS213+. 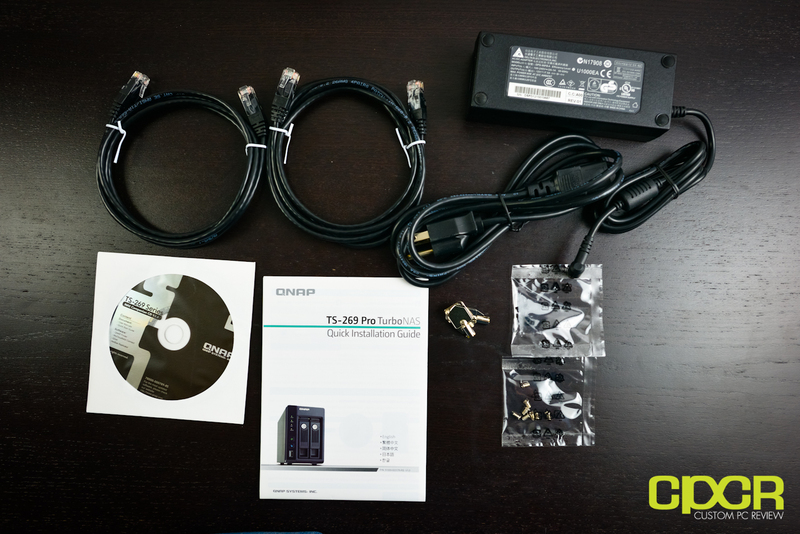 Included in the packaging we get some documentation, a software disk, mounting hardware, a Cat 5e cable, and an EDACPOWER power adapter capable of delivering up to 72w. 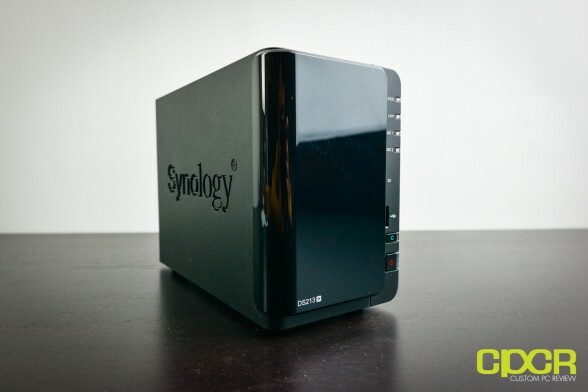 Here’s a look at the Synology DiskStation DS213+ itself. The exterior of the unit is constructed of heavy duty plastic. The front of the unit also includes a glossy cover which hides the hard drives bays inside. Here’s a look at the rear I/O for the DS213+. Synology hasn’t included a whole ton of connectivity options here, but we do get two USB 3.0 ports, a Gigabit ethernet port, an eSATA port, a Kensington lock port, and a power port. 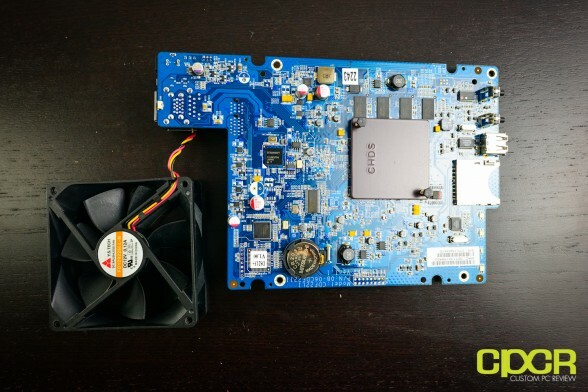 Synology has also included a 92mm fan that stretches across the entire width of the DS213+. Here’s a look at the front of DS213+ with the front cover removed. Behind the cover we get two drive bays as we’ll see in a little bit. On the right side of the drive bays, we get some LED indicators, a SD card slot, a USB 2.0 port, an one touch copy button and a power button. Here’s a look at the drive trays themselves. Synology is using heavy duty plastic drive trays on the DS213+, which shouldn’t be a huge issue once the drives are installed. The drive trays are compatible with both 2.5″ and 3.5″ drives. 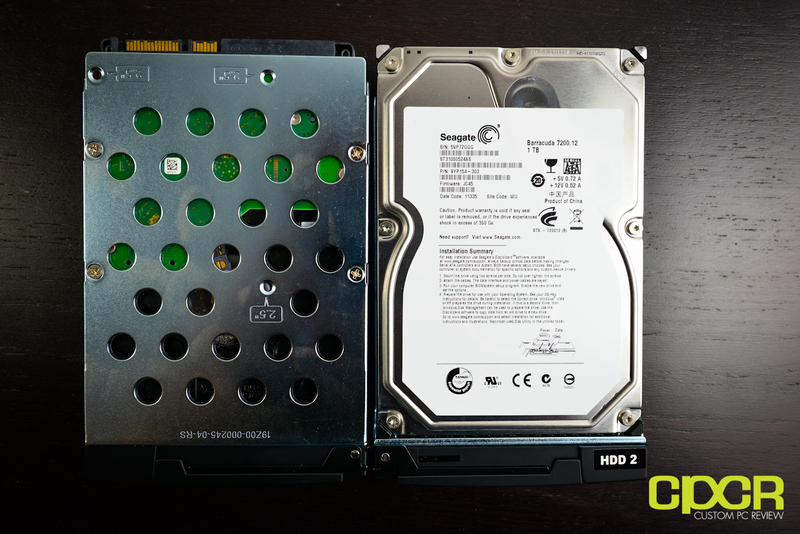 For our testing today, I’ll be using two Seagate Barracuda 1TB 7200rpm drives as installed here. While I’m using these drives for testing, they are NOT recommended for use with NAS units. Instead, be sure to take a look at the Western Digital RED line of NAS oriented hard drives or the Seagate Constellation ES enterprise grade hard drives. 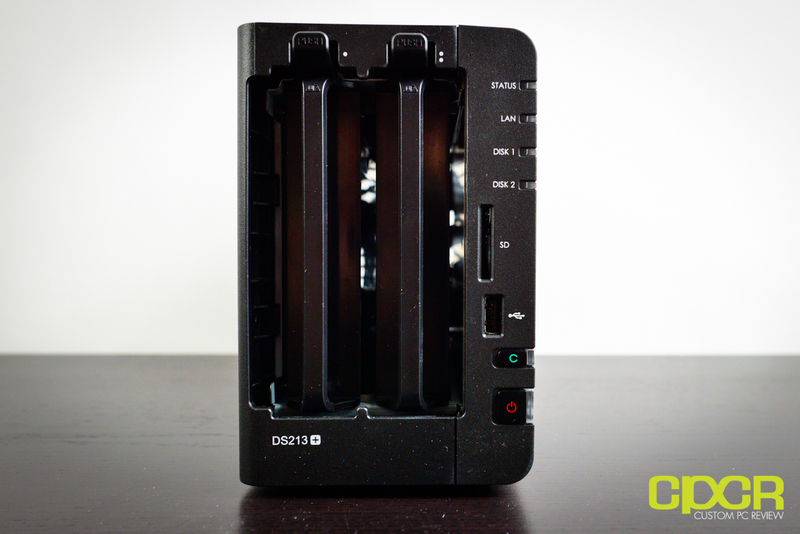 The Synology DiskStation DS213+ includes several lights to notify you of the status of the each drive, status of the LAN, and the general status of the device. The unit also includes alarm warnings as well to notify you of any problems. 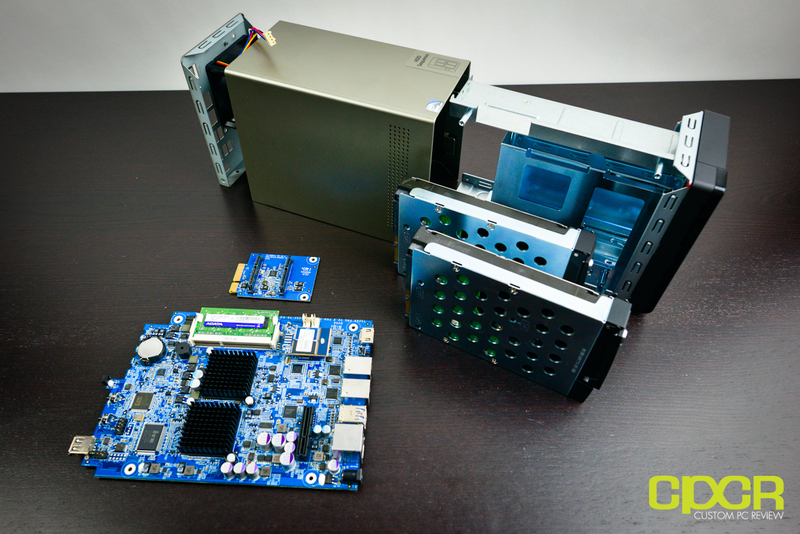 Here’s a look at the DiskStation DS213+ with everything taken apart. For cooling, Synology is using a 92mm Y.S. Tech fan. The fan is replaceable; however, does require the unit to be taken apart. 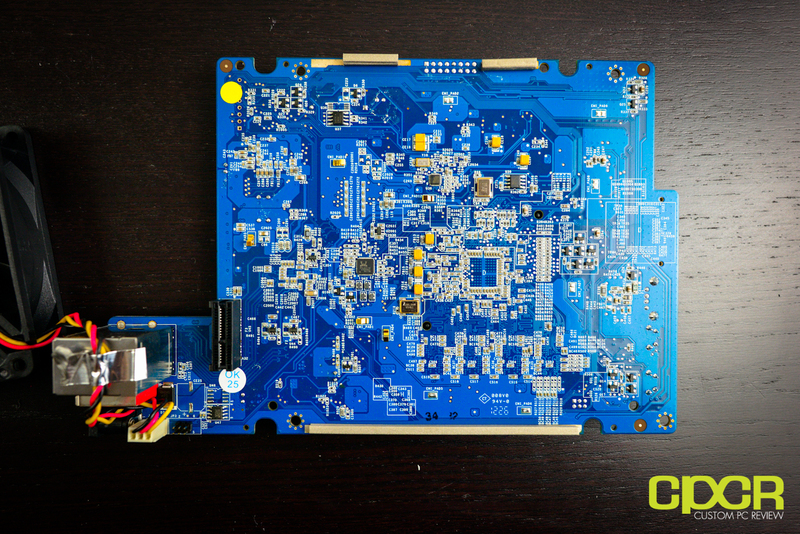 Here’s a look at the front of the PCB. Unfortunately, nothing is user upgradeable on the DS213+. The CPU of choice here isn’t based on either ARM or x86, but it’s a Freescale P1022 PowerPC based dual core processor clocked at 1.067 GHz. There are also 4 1Gb Samsung DDR3 memory chips (Model #K4B1G164G-BCH9) soldered directly to the PCB for a grand total of 4Gb (512MB) of memory. Here’s a look at the rear of the board. There’s a single PCIe slot here for the 2 port SATA PCIe expansion card. Like the QNAP software, Synology’s software is just as feature packed and there’s simply way too much to cover in depth. 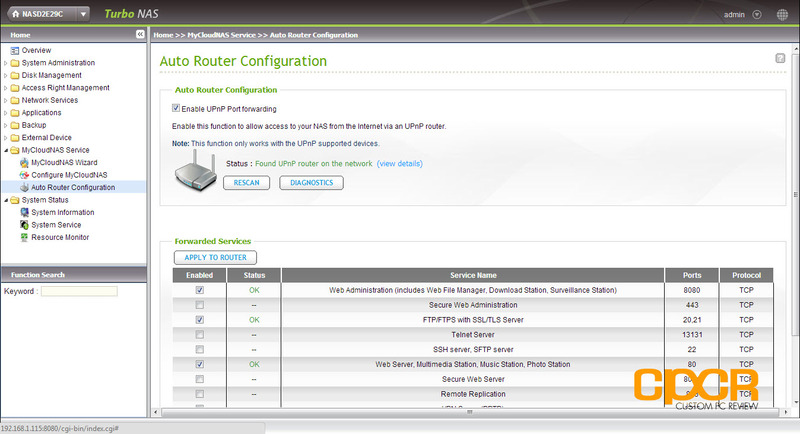 Most Synology NAS units including the DS213+ use the DSM software, which is currently at version 4.1 (tested today). 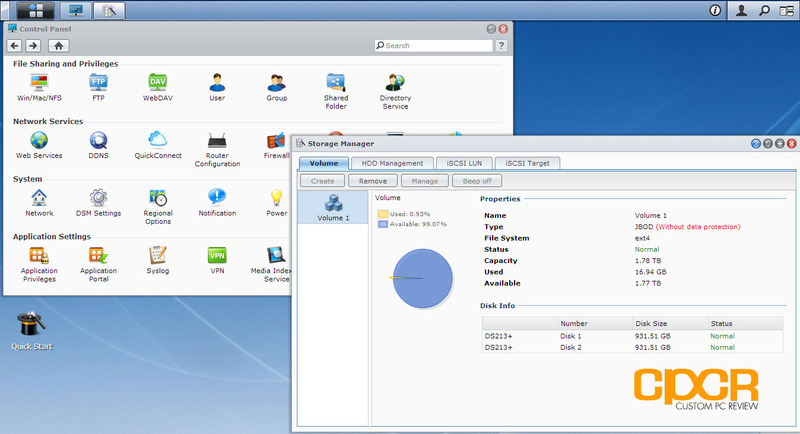 Those interested in learning more about the DSM (DiskStation Manager) software, be sure to check out the dedicated page here. Those interested in checking out a live demo of the DSM 4.1 software, you can find it here as well. Also be sure to check out our review on the Synology DiskStation DS1512+ and the Synology DiskStation DS212, which has information regarding DSM along with the iOS apps offered by Synology as well. 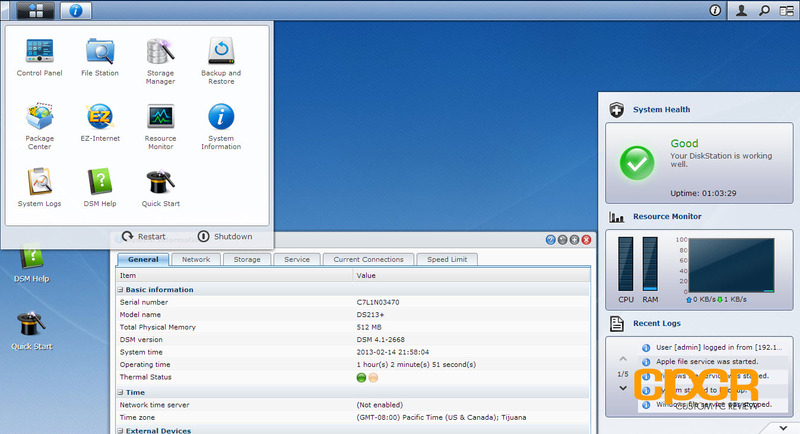 Synology’s DSM software is a heavily modified Linux based operating system. What I’ve noticed about the DSM software when compared to other NAS units is that Synology’s software is extremely polished and a lot of effort has been done to make it very easy to use. Above, we have the storage manager, which allows for the configuration of the disks. 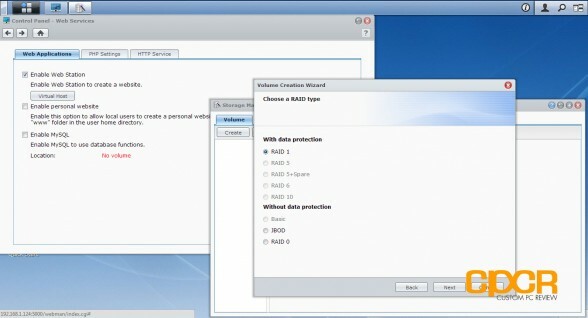 As you can see, only JBOD, RAID 0 and RAID 1 options are available. Synology also has a SHR (Synology Hybrid RAID) option, which is Synology’s own RAID option, but there’s only benefits to using this option when you have more than 2 drives with at least one of the drives having a different amount of storage capacity. For more information on SHR, be sure to check out the feature page here. 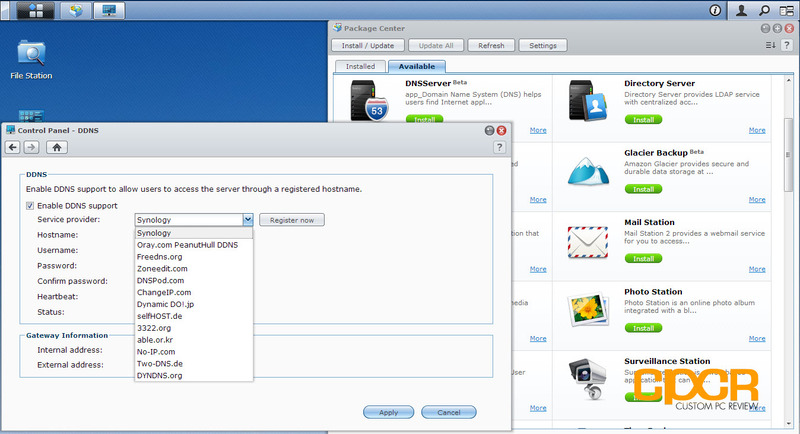 For accessing the DiskStation on the go, Synology’s DSM 4.1 software also includes DDNS functionality, which will allow you to access the DiskStation via a custom domain name. This functionality is very similar to QNAP’s MyCloudNAS service and pretty much allows you to access your DiskStation anywhere an internet connection is available, even if you have a dynamic IP. 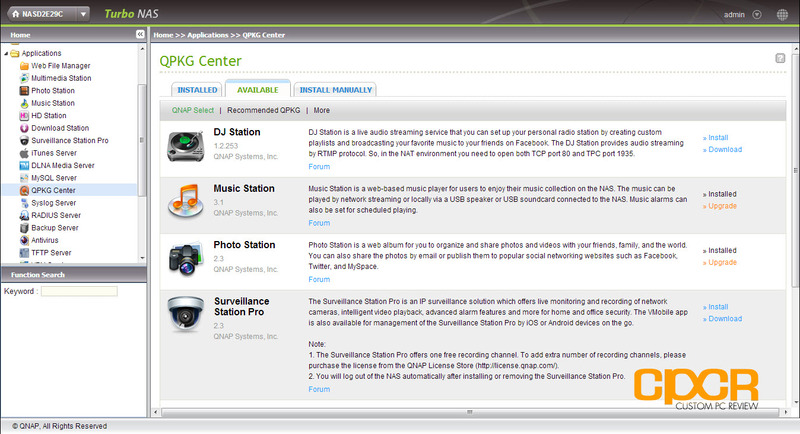 Synology also offers a ton of software packages as well, which can be found here. As you can see from the package center, it’s pretty much a click and go straight from the GUI type of deal. 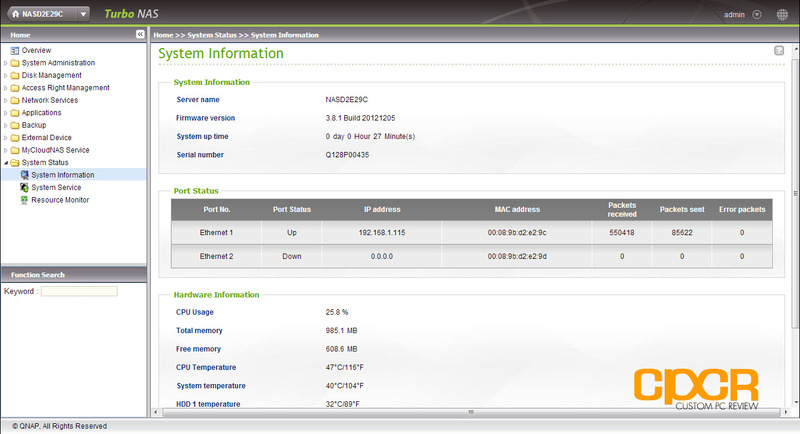 Here’s a look at the system information menu for the DS213+. In addition to general information, we also get information on the storage volumes, network settings, services activated, etc. Special thanks to Gigabyte, Kingston, and HSPC for sponsoring our test bench! For our testing today, the test system was loaded with a Windows 7 x64 virtual machine spec’d with one core and 2GB of memory. This is to avoid skewing test results as client devices with large amounts of memory may cache data locally rather than making requests to the NAS unit, which may result in higher scores than the NAS unit itself can deliver. 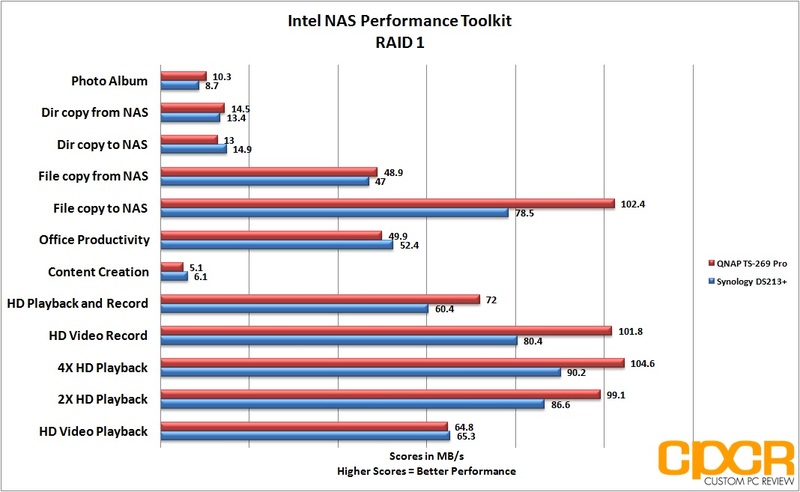 Intel NAS Performance Toolkit (NASPT) is a NAS benchmarking utility developed by Intel which simulates real world NAS workloads. Performance across the board was very good with both the Synology DiskStation DS213+ and the QNAP TS-269 Pro. 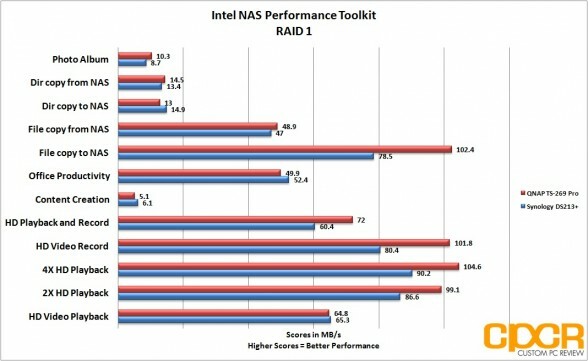 Both NAS units were neck to neck in performance; however, the TS-269 Pro with the faster Intel Atom D2700 processor has a clear advantage over the DS213+ when it comes to RAID 1 performance. 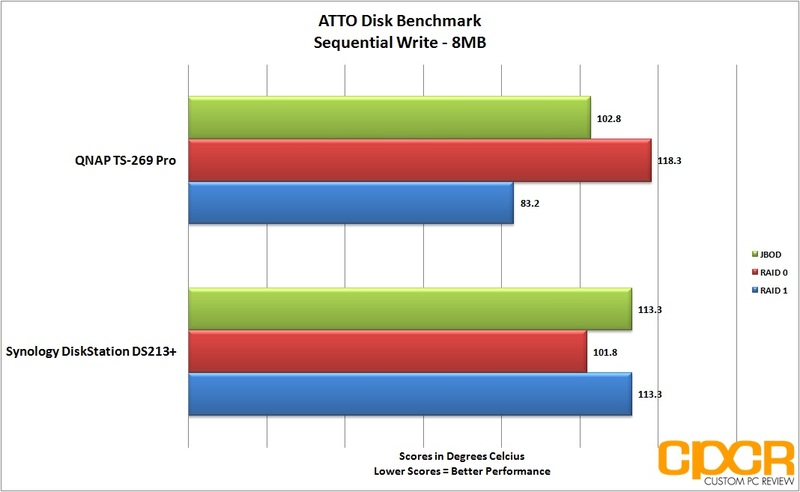 ATTO Disk Benchmark is one of the industry’s oldest and most popular benchmarks for testing disk read/write speeds. This benchmark allows read and write testing using predefined block sizes and gives us a good idea of read/write speeds with different sized files. Our testing today will only include sequential read and write testing for files at the 8MB filesize. 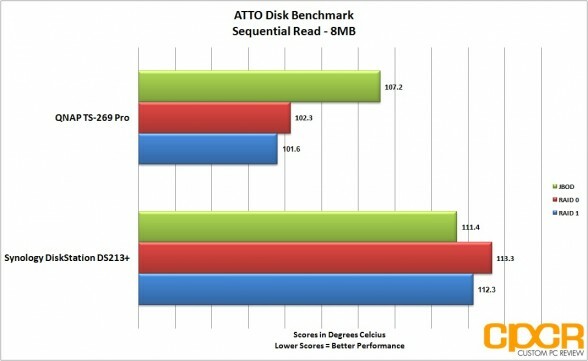 ATTO Disk Benchmark is slightly strange especially after seeing the results from NASPT, but the Synology DiskStation DS213+ was able to beat the QNAP TS-269 Pro in most drive configurations. That said; transfer rates for both NAS units are well into the 100 MB/s range, which is pretty much where Gigabit Ethernet tops out. Here we’ll be testing the idle and load power consumption for each of the NAS units below. Idle power consumption is taken after the NAS is started and the hard drives have spun down. For load power consumption numbers, I take the maximum power consumed after creating a RAID array, running Intel NASPT, and running ATTO Disk Benchmark. All power consumption figures are taken using an Extech 380801 Power Analyzer connected via a Tripp-Lite LCR2400 Line Conditioner. Power draw here is as expected. 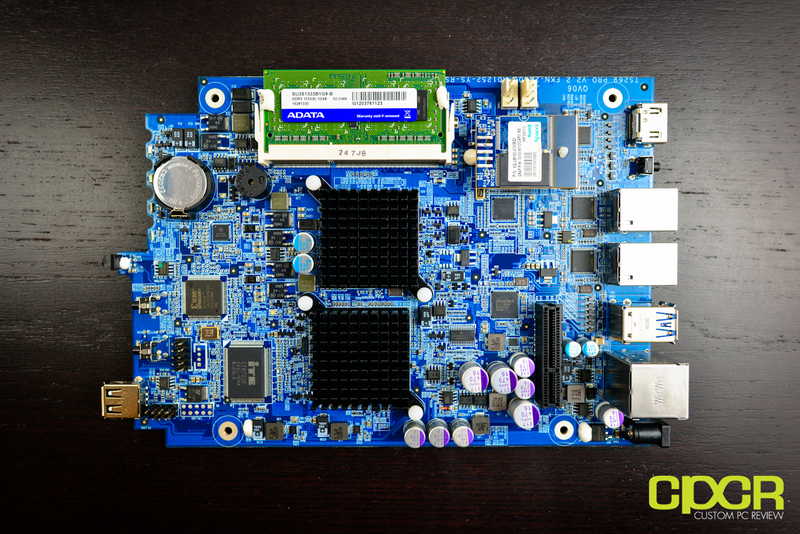 The QNAP TS-269 Pro’s Intel Atom D2700 processor draws significantly more power than the Synology DiskStation DS213+’s Freescale P1022 processor, even at idle. At load, the difference is even more pronounced. Noise levels on both the Synology DiskStation DS213+ and the QNAP TS-269 Pro were extremely quiet at idle and did not register on our Extech 407750 with its 30dB noise floor. At load, noise levels are dependent on how loud drives being used are. 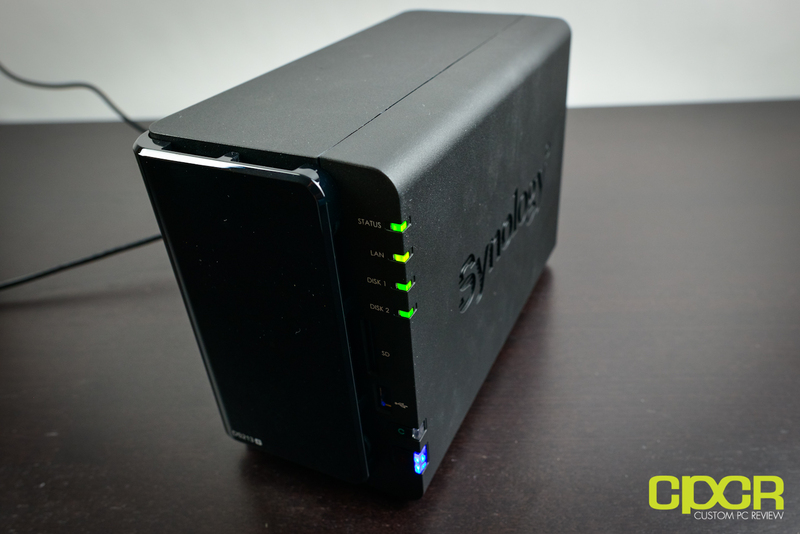 Synology rates the DS213+ at a mere 19.9 dB while QNAP rates the TS-469 Pro at 33.3 dB. 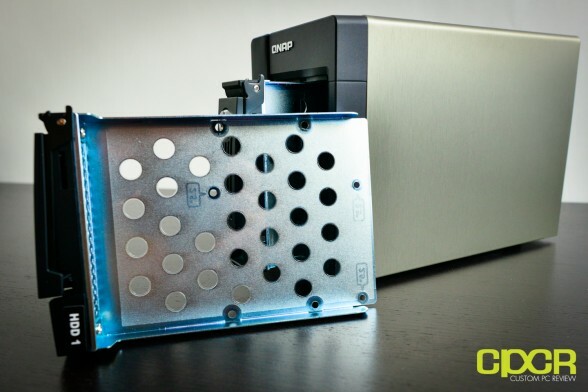 Drive temperatures for both the QNAP TS-269 Pro and the Synology DiskStation DS213+ ran at around the low 30°C mark with the DS213+ reporting slightly lower temperatures than the QNAP TS-269 Pro. This makes sense as the more powerful QNAP TS-269 Pro is using a smaller 70mm fan while the Synology DiskStation DS213+ is using a 92mm fan. After incorporating both these NAS units into my day to day operations here, I’ve found that both the TS-269 Pro and the DS213+ will fit the bill nicely for anyone looking for a solid 2 bay NAS solution for doing regular backups, streaming media, accessing data on the go, etc. In terms of software, QNAP’s software definitely feels a bit more robust than Synology’s DSM software and the ability to use 3rd party QPKG files does give it an edge as to the amount of functionality that’s available. However, Synology’s DSM software does have an additional bit of polish and is much easier to use than what’s offered with QNAP’s. 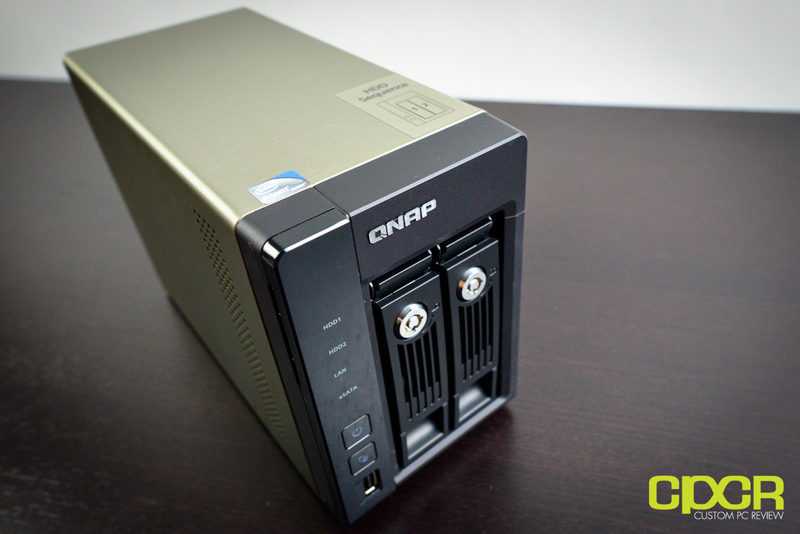 The QNAP TS-269 Pro is currently priced at $588.99, so we’re looking at a fairly high premium for this unit. However, before you write off the TS-269 Pro due to price, definitely consider the fact that this unit is pretty much a low powered server with a very feature rich Linux based operating system behind it. 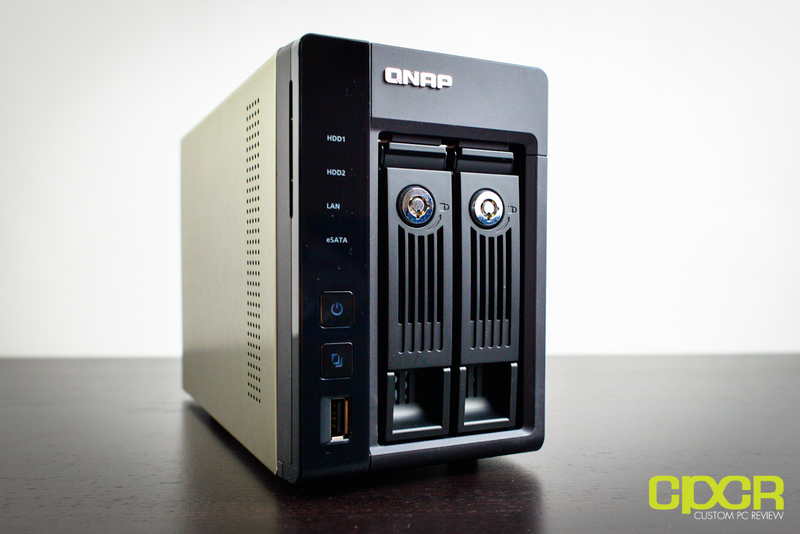 The main benefit of the QNAP TS-269 Pro specifically is that it offers a ton of performance with its fast processor. Businesses looking to use the unit as a web server for internal web applications such as CRM or groupware type applications will find that the TS-269 Pro will fit the bill nicely, even with a large number of users. On the flip side, home users looking for a central entertainment and backup hub won’t be disappointed with the TS-269 Pro’s ability to not only be a center for storage, but its ability to also playback media to the big screen through XBMC. 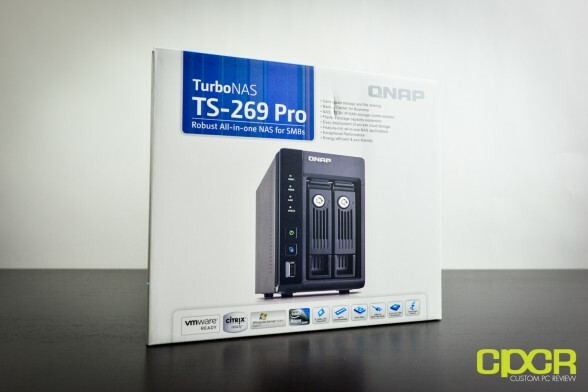 For home users who don’t necessarily need the performance of the TS-269 Pro, QNAP also offers the QNAP TS-269L, which is currently retailing for $100 less at $489.00. The TS-269L is almost the exact same unit as the TS-269 Pro except it has a slower Atom D2550 clocked at 1.86GHz processor and some other minor differences. 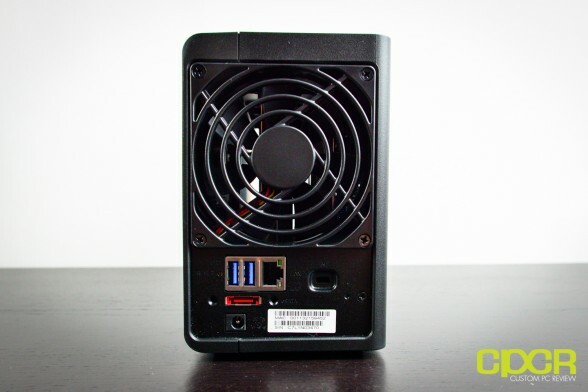 Those looking for a NAS specifically for use as a home backup solution, media server, personal cloud, or for XBMC will find that the TS-269L has more than enough grunt to handle these tasks. The Synology DiskStation DS213+ on the other hand is priced at a much more modest $399.99; however, you are looking at sacrificing performance when compared to the TS-269 Pro and even the TS-269L as well. That said, small businesses looking for a powerful backup solution or something to run CRM or other web apps for a limited number of people will find that the DS213+ has more than enough power to handle the task. 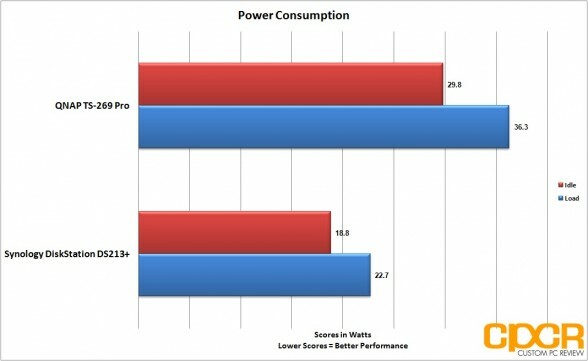 An additional benefit to the DS213+ is that it’s significantly lower power consuming when compared to any Intel Atom based NAS. Since NAS units are designed to be run 24/7, any power savings is beneficial. Those looking for a more powerful solution, but really want the ease of use the Synology DSM software offers can check out the beefier Synology DiskStation DS713+, which features the same Intel Atom D2700 2.13GHz processor, the same 1GB of DDR3 and dual Gigabit LAN connectivity offered by the QNAP TS-269 Pro reviewed today for $529.99. Like the QNAP TS-269 Pro and the TS-269L, the Synology DiskStation DS213+ also has a little brother, the DiskStation DS213. The DiskStation DS213 is currently retailing for $299.99, which is $100 less than the retail price for the DS213+. That said, you will be taking a hit in terms of performance as the DiskStation DS213 uses a Marvell 2GHz ARM processor, which is significantly slower than both the Freescale and Intel Atom processors. That said, home users looking for a simple backup solution, looking to use the NAS as a personal cloud, or to stream media will find that the DS213 is a perfect solution at a fairly affordable price. Overall, I think both the QNAP TS-269 Pro and the Synology DiskStation DS213+ fill their price brackets quite nicely and offer enough features backing them to make them well worth the money. 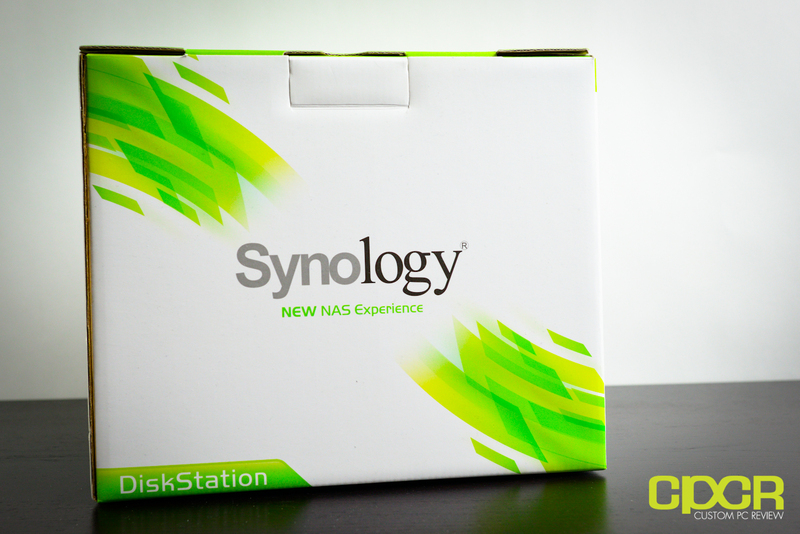 NAS units from both QNAP and Synology don’t simply just meet the standard – they are the standard. Highly Recommended! Good review, but the Synology DS713+ would have been a better comparison to the QNAP Pro version.